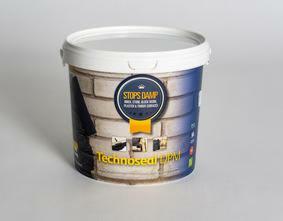 Technoseal is an SBR latex based liquid damp proofing paint for water proofing applications. The paint dries to form a tough semi-gloss finish. Can be applied to walls under render or plaster as a water barrier. Water based compounds that can be applied even to damp backgrounds. Non-toxic, non-hazardous, solvent and plasticiser free. Good bond too many substrates. Toughness, high flexibility, extensibility and good crack bridging properties. Alkali resistant. Can be applied to alkaline surfaces.